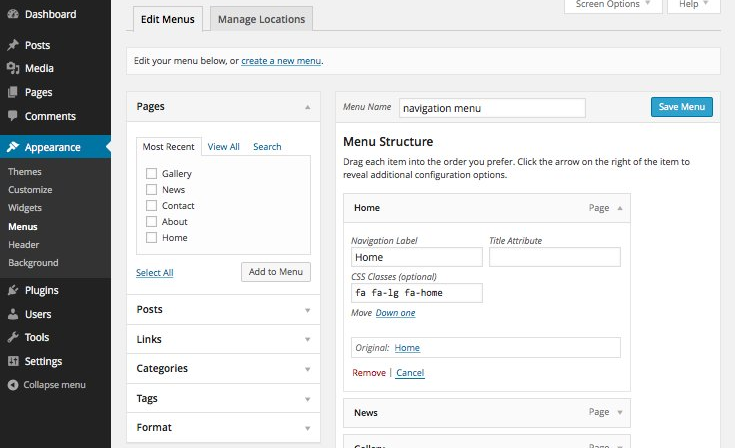 You wonder how can you add Icons to WordPress menus without a plugin? However, adding icons to your site’s navigation menu gives your visitors some visual clues about the content and also adds a nice design touch to your site. So definitely thinking that how it would possible to add icons next to each item in your navigation menu without any plugin while WordPress doesn’t have such feature. But Instead of the plugin, we’ll use the Font Awesome icon library, just calling it from your theme’s functions file (You could add via a plugin too). Font Awesome is one of the absolute best. But unfortunately, you can’t just jump in and start using Font Awesome icons on WordPress menus right away. Instead, you’ll need to do some steps before you can add icons to WordPress Menu without plugin. We’ll also demonstrate how you can do this by a plugin. Now let’s take a look at how to easily add image icons to WordPress menu. 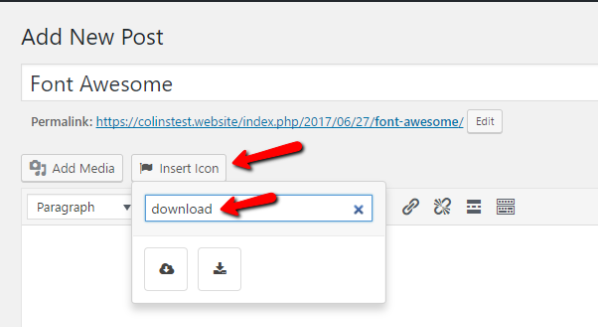 But before doing this you have to Add Font Awesome Icons to WordPress. Once you had done, you can use the CSS classes in each menu item to add icons to our menu. 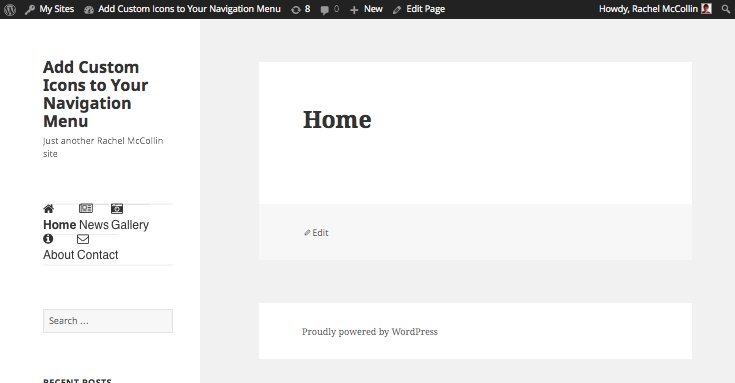 In the WordPress dashboard, go to Appearance > Menus for editing your navigation menu. Over there you can create a new navigation menu If you haven’t already created a menu, and make sure you’ve ticked display location as a “Primary Menu”. You might not able to see CSS Classes in a menu item so for this, you need to switch it on first. At the top of the screen, click the Screen Options drop down tab. And these 3 classes stand for as below. Once you have done save your menu by clicking the Save Menu button and check for changes by visiting your site. If the above method is not worked for you and you’re site looks like this. You should use better or premium themes. OR you can try a plugin instead and it’s recommended for beginner users because it doesn’t involve code. 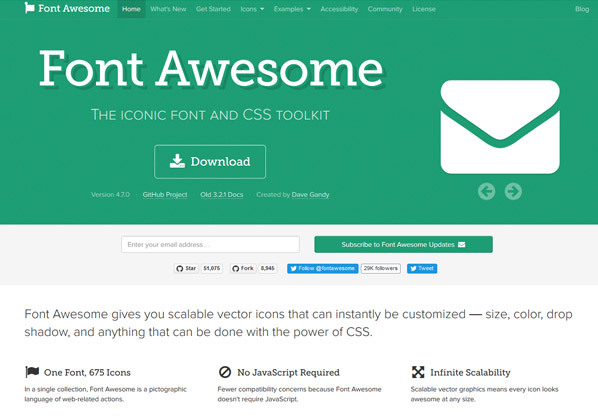 The first thing you need to do is to install and activate the Better Font Awesome plugin. For more details, see the guide on how to install a WordPress plugin. Once you activated a plugin, you can find this plugin’s setting in WordPress setting panel that you can access by going to Settings → Better Font Awesome, or you can leave as default. With the plugin method, you don’t need to always copy CSS classes to insert Font Awesome icons in posts or in the nav menu. Because when you create a new post or page, you’ll notice a new Insert Icon button next to the Add Media button will add. If you click on it, you’ll see all the available Font Awesome icons, as well as an option to filter the results. Now just click on a chosen icon just like in the above image (download) and that’s it.